Ang Lee's first 3D creation "Life of Pi" has been premiered as the opener of the 2012 New York Film Festival on Friday, September 28. Despite the fact that it starred relatively unknown international actors, the adventure movie successfully pleased film critics and reviewers. They gave positive comments over the touching plot and praised the "Brokeback Mountain" helmer's stunning 3D work. "Excuse me while I wipe my Life of Pi tears. It's clunky at times but overall quite affecting," wrote HitFix's Oscar blogger Kristopher Tapley. Awards Daily's Sasha Stone gushed, "I am an atheist - so Life of Pi was something for me to behold. My closed mind opened. And I am so beholden to Mr. Lee. It isn't that I 'found god' but it's that I was able to release something... a frustrated something. Sigh. Shrooms!" Having nothing but high praise for the film's wonderful visuals and 3D effects, Movies.com's David Ehrlich tweeted, "people say the cinema is dying and yet films like this prove that it's *still* just being invented. #NYFF." Comparing the drama to Martin Scorsese's "Hugo", Ehrlich said, "LIFE OF PI has the most effective 3D since HUGO, proving that while the format is pushed for the money, it's meant for the masters. #NYFF." Other critics, meanwhile, gave good reviews to the film's storyline. "Thrilled there's so much heart and humanity behind Ang Lee's stunning visual feast. #NYFF," wrote Hollywood.com's Matt Patches. He also was a fan of the CGI tiger in the film, "Life of Pi's Tiger is on par with Caesar in ROTPA ('Rise of the Planet of the Apes'). An actual performance there." The film was also predicted to score success in next year's Oscar run. Collider's Steven Weintraub tweeted, "was spellbound watching LIFE OF PI. An incredible movie made even better by amazing 3D. It's definitely in the mix for end of year awards." On the other hand, Thompson on Hollywood's Anne Thompson wrote, "Ang Lee's transcendent Life of Pi reminds that film can heal and inspire. It will play for global critics, audiences and award givers." 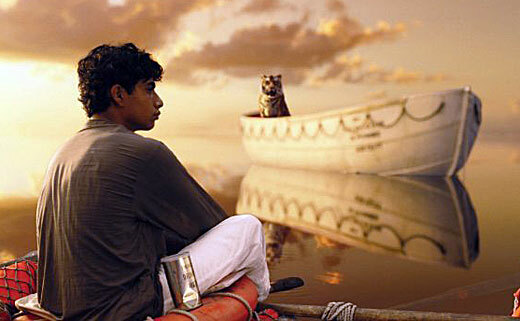 Lee's "Life of Pi" first wowed film reviewers after it unveiled its first teaser at CinemaCon earlier this year. The story focuses on a young man who survives a tragic disaster at sea and is hurtled into an epic journey of adventure and discovery. While marooned on a lifeboat, he forms an amazing and unexpected connection with the ship's only other survivor - a fearsome Bengal tiger. The film will hit the U.S. theaters on November 21.